My husband and I have always loved the group Chicago. As I was taking this image, the song…”Color my World” started to resound in my head. I have always been a romantic at heart♥ Now to show my age…I can remember slow dancing to this at the school dances and prom…sigh. Does this song bring back any memories to you? Photographers look for color combinations that resound with YOU! Not what might be the trend or what the color wheel states, but what gets your heart beating just a little faster. 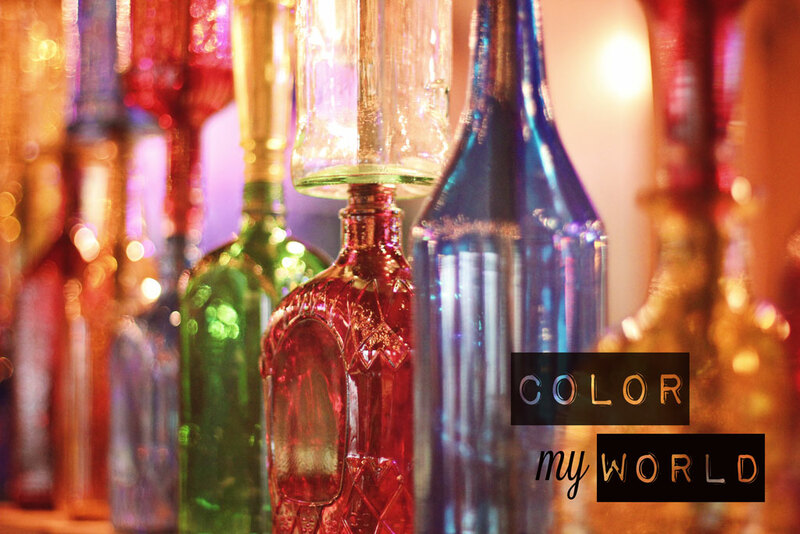 When I saw these colors together with the glass bottles, I just let out a big sigh! I stopped what I was doing immediately, picked up the camera and starting shooting away. This color combination spoke very strongly to me. Don’t they just look like a bold courageous group? If this is your first or second time visiting, won’t you consider joining the Pride in Photos family? Go to the top right hand corner and fill in your email address, so you don’t miss any of the inspiration and tips that will come your way. Make today as colorful as you can! Thank you Laurie for your beautiful pictures and your visit “Du côté du Teich”. Stunning colours Laurie; and I love Chicago and Color my World! I am singing the song now for the rest of the evening! I hope you don’t mind if I reblog your link on my 2nd reblog page? A sparkling photo of sparkling bottles. Beautiful capture, Laurie! I totally understand about dropping everything to get the shot! Love the colors and bokeh! ooooh those colors are beautiful! and the sparkle of it, too! lovely capture; great tip! thanks for sharing at 1440! Beautiful combination of colors. I especially like the way your photo blends them in the area to the left! Oooh these colors, yes they are singing to me too! You captured the light through them so beautifully! Great Color and a wonderful photo! Nice to meet you, found you via Spilled Milkshake Getting to Know you Blog Hop! The colors are just stunning in this blog, Laurie!!! Great job! That song sure brings back a lot of memories!! I actually went to a Chicago concert back in the day with a bunch of friends. Totally loved them. I enjoyed your photo and the Georgia O’keeffe quote too. She was amazing and in my own little way, I feel those words when I’m in my craft. What beautiful colors in the glass! I love your post — and I do love color! I think of the (old!) song, “Color my world with sunshine yellow each day.” Ha ha! The colors in the glass sure do bring out the rainbow in the photo! I love me some colors. Very nice shot, Laurie. Love the colors. Yes. the colours here are very nice indeed. Those are beautiful colors and a beautiful capture. I love Chicago too. We are hosting our first linky party later today, we’d be delighted if you could join us at pret-a-vivre.com. Have a beautiful weekend! Such beautiful color here today. Has me smiling.. This beauty makes my day. Love the colour, sparkle and the colourful bokeh! This was the theme song for one of my proms! Always loved it, and this photograph is just beautiful. Chicago reminds me of my childhood and teenage years! Lots of memories. Love these beautiful bottles. The colors are invigorating! When I saw your photo, I let out a big sigh! I love antique bottles and color, so the combo is unbeatable. I too collect a variety of colored glass.Love it ! Lovely photo. Stunning photo and it looks like the bottles are glistening! I could see this photo blown up really large over a couch to add a pop of color to a room! Oh yes I remember that song, Chicago has so many great songs. My records are all gone but the songs remain in my head. Great photo! I love bright and startling colours! Your shot is lovely. Now that is just a fantastic shot, Lauri! I’m going to have that old Chicago classic happily running through my head today. Wonderful song, beautiful picture! Great shot! Clear and colorful. Wunderschöne Farben und ein tolles Foto!!! These colors call to me too! Love warm colors! So wonderful! I love the way you shot this. You have really brought out the “glaze” in addition to the color. I could not help but click on “Color my World” by Chicago right a way. A nice song. The picture is brilliant. I like the color and the pattern. That’s a lovely picture. I have always liked the look of colorful bottles in a sunny window! Love, love, love colors! Thanks for reminding me the words to that song!